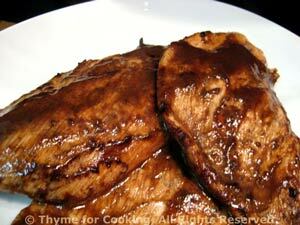 Balsamic Glazed Turkey Cutlets, Thyme for Cooking gourmet menus. Light the grill, make the marinade, assemble the Salad (no cooking required) and cook the turkey. You could probably do it in under 20 minutes... but why rush? Part of what cooking in summer is all about is making things easy. 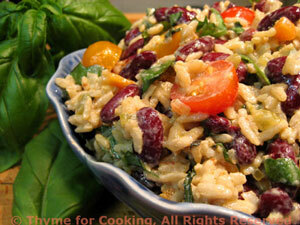 Cooking extra Rice Pilaf to use to make a salad is a perfect example. All that's needed is more vegetables and a light vinaigrette to make a great summer salad! Any leftover salad makes a lovely lunch. This dressing is similar to Ranch, but with far fewer calories and all natural ingredients. Add to leftover Rice Pilaf and mix well. Slice the tomatoes and add to Rice. Snip the basil and add to Rice. Add half of the Herb Dressing to the salad and taste. Add more until your happy. Serve. Note: The Creamy Herb Dressing will keep a week.... And makes a great dip for raw veggies.